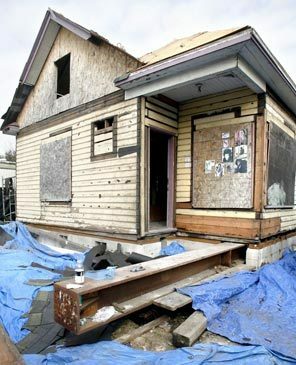 Erik Lacitis of The Seattle Times reports that the demolition crew has been working at a fast pace, and the tiny, 900-square-foot house where Jimi Hendrix lived from ages 10 to 13, and first showed his love for music, was down to its shell Monday. Despite an eight-year, $100,000-plus effort by Pete Sikov — a Seattle real-estate investor who at first wasn’t a Hendrix devotee, but became one — the historic structure is gone. If you’re a fan, vanished will be the chance to drive by and imagine how it would have been in the early 1950s for Jimi Hendrix, who died in 1970 at age 27 in London, apparently choking on his vomit after an unintentional combination of sleeping pills and alcohol. The value of the intact home, however dilapidated, was that it allowed visitors to imagine the poverty and simple beginnings of one of rock ‘n’ roll’s greatest musicians. It saddens Cross that the 100-plus-year-old house is gone. “It’s all a shame; too bad no city body stepped up to the plate to save the place Jimi lived in. Let’s be blunt: He’s the most famous guy to ever be born in the city of Seattle,” Cross said. His crew is throwing out any newer additions made to the house after Al Hendrix, Jimi’s dad, bought it in 1950 with a $10 down payment. The entire roof, for example, went to the dump. “It awaits the future,” Sikov said. Perhaps, he said, pieces could be sold as a fundraiser for First Place, an agency that helps homeless children and which Sikov has assisted in the past. “Can you imagine a guitar made out of wood from Jimi’s house? Who wouldn’t want that?” Sikov said. Had it not been for Sikov, the Hendrix home would have been demolished long ago. He became involved in 2001, he said, when asked to help save the home, then at its original location at 2603 S. Washington St. in the Central District. The site was going to be developed for condominiums. “It seemed a worthwhile endeavor,” said Sikov, 54. Sikov paid more than $30,000 to buy the house, move it and lease a city of Seattle-owned lot at 2010 S. Jackson St. He and the James Marshall Hendrix Foundation had hopes of renovating the house and turning it into a music center. It never worked out, with the city and Sikov exchanging accusations about broken promises and missed deadlines. The city moved to have the home demolished. But Sikov then saw a for-sale ad in the Sunday classifieds for the Hi-Land Mobile Manor in Renton, which, as it happens, is across the street from Greenwood Memorial Park Cemetery. That’s where Hendrix is buried, and where fans still flock to his memorial and leave everything from guitar picks to notes to flowers. Sikov has done well in real estate. He had the money to buy the 3-acre mobile-home park for $1.84 million, reaching an agreement with the city of Renton to give him a chance to develop the site, with the Hendrix home as a centerpiece. Neil Watts, Renton’s director of development services, said the city knew the problematic history of the Hendrix home. It also wanted to do something with the mobile-home park that it considered an eyesore. To cover its bet, however, Renton had Sikov set aside $5,000 to demolish the house if things didn’t work out. Four years went by, and Renton gave Sikov repeated extensions to do something. Sikov said he negotiated at length with several developers, but the deals fell apart. Finally, the city gave an ultimatum: The house was to be gone by March 27. Of course, there are plenty of photos of the Hendrix home. But they don’t match the experience of walking around the old structure. It was the first real home the family had, said Leon Hendrix, with their dad and mom, Lucille, living together there. The marriage was unraveling, and the boys would end up being taken care of by their father, an alcoholic who sometimes wasn’t around. Neighbors would take in the brothers and feed them. It was a life of poverty; Leon Hendrix remembered the electricity being shut off for lack of payment. He also remembered using an oil furnace in the living room to burn the coating off copper wiring that their dad had collected, and would then resell. But it also was the home where nearly every day after school, Jimi would turn on his dad’s radio. The younger brother remembered how Jimi used a broom as a make-believe guitar. Later, author Cross said, Jimi would take the family’s hi-fi stereo and somehow rewire it to use it as an amp. Then, on a borrowed guitar, he’d begin playing, filling the small house with music. “I loved that house,” Leon Hendrix said.